Joan Maxwell’s boats travel all around the world, but her company — and her heart — is anchored in Edenton. 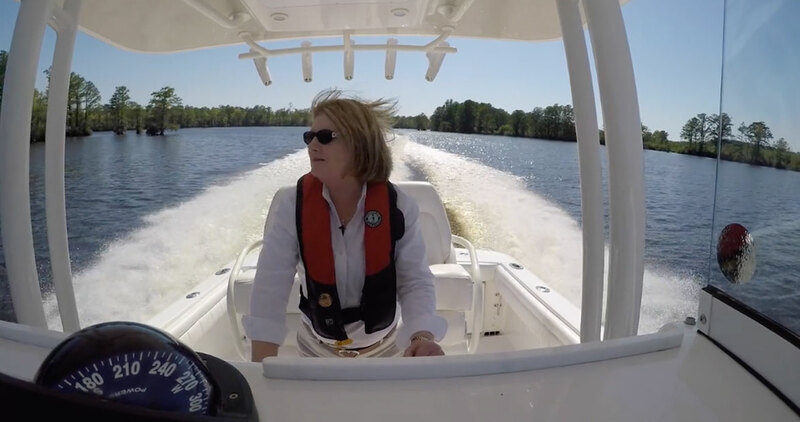 When she’s not serving as a chairperson of the National Marine Manufacturers Association — the first woman to do so — Joan Maxwell oversees the day-to-day operations of Regulator Marine in Edenton. This September marks 30 years since Maxwell and her husband, Owen, built the first Regulator 26, their now-signature 26-foot offshore fishing boat. Now one of Chowan County’s top employers, the company built about 250 boats in 2017, the majority of them destined for waters far beyond our coast. 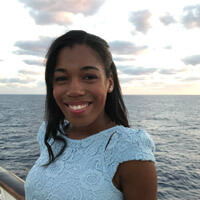 Our State sat down with Maxwell to learn what drives her passion for this world-renowned boat company anchored in eastern North Carolina. OS: You and Owen have created a successful boatbuilding business. How did you both fall in love with water? OS: You built the first Regulator Marine boat in 1988. What were the company’s earliest days like? Maxwell: I remember the initial design concept was for a 23- to 25-foot-long boat. In its final stage, the boat grew to 25 feet, 10 inches, so we called it the Regulator 26. We built that boat in an old A&P grocery store that had been converted to a manufacturer of cheesy snack foods. During our first winter, when we turned on the heat, the factory smelled like Cheetos! But my strongest memory of that time was our desire to do something where we could work together to achieve a goal, and we did. OS: Once Regulator successfully launched the 26, did you and Owen have plans for what came next for the company? Maxwell: When we built our first boat, we didn’t have a concept of where the company was going. We celebrated every milestone. Each hundredth boat was a big deal to us because we hadn’t dreamt that big. But then we learned that it was very difficult to find a dealer who wanted to carry only one style of boat. They wanted a line of boats, so we needed to expand to survive. OS: What types of sportfishing boats does Regulator Marine build today? Maxwell: Our current lineup includes models ranging from 23 to 41 feet long. Regulator Marine boats were designed from the very beginning to go offshore, run in rough waters, and, most important, bring customers back. The boats are designed by naval architect Lou Codega —known in the industry for the safety and reliability of his high-speed bottom designs — in collaboration with Owen and the in-house engineering teams. They work together to create what I consider the finest in offshore fishing boats. OS: Regulator is a well-respected international brand. How have you built your reputation as a strong competitor in the industry? Maxwell: It’s a lot easier today because we have this almost 30-year history, but starting out, we’d face questions from potential buyers like, “Who are you?” or, “You have a five-year hull warranty, but are you even going to be here in five years to support this warranty?” So there was a lot of time spent trying to convince people that we’re worth the risk. Now, customers know that we can provide a great product and, most important, that they aren’t dealing with corporate America; they’re dealing with Owen and Joan Maxwell. If they have a problem with a product, we’re here. We stand behind it. OS: How has access to public power enabled Regulator Marine to better serve its community? Maxwell: If we have an electrical issue, it’s taken care of almost immediately because there’s a recognition that without this place running, people don’t have jobs to go to. For instance, after a recent hurricane, we were without power for about three days. The town was very interested in us getting back to work and providing a sense of normalcy for people here, so ElectriCities got the power back on very quickly. It’s providing more than electricity; it’s providing for livelihood. OS: What has the experience of building your company in Edenton been like for you and Owen, and Regulator as a whole? Maxwell: Owen and I have lived in Edenton our whole married life; September makes 33 years. 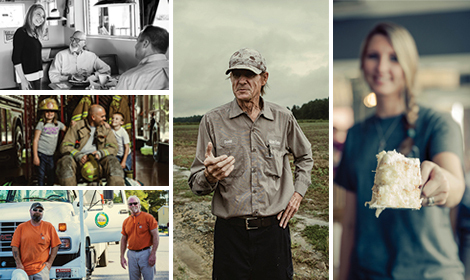 People might be surprised to know that a world-class company is located in Edenton, North Carolina, but being a part of our small community is very important to us. It’s really humbling to be reminded when I’m somewhere else in the world and see a Regulator that people all over the globe are using our boats, and that each one came from right here. The local pride in Regulator Marine runs through all of us, from my seat all the way down to the last person on the plant floor. We all recognize that we’re not building something for ourselves. We’re building a dream.